They say good things come in small packages and Wildair blows that concept out of the water. 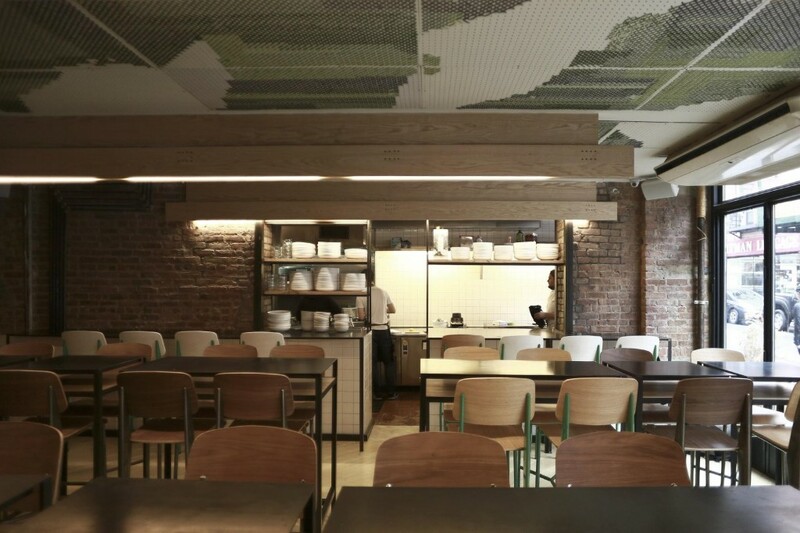 I have been wanting to visit Wildair since it opened because it’s big sister and neighbor, Contra, was such a creatively enjoyable and tantalizing culinary experience. I delayed going because my car is in Connecticut and I am a one stop subway chick…no transfers. I only travel nonstop. Saturday, I was on a Wildair mission so David and I walked from the upper west side to Wildair on the lower east side. It was a cool, crisp January afternoon…the perfect temperature for a 7 mile jaunt. The great thing about walking in Manhattan is that every neighborhood is interesting, crammed full of attractions…retail therapy eye candy, noteworthy, scenic parks and stunning architecture. If I walked 7 miles in Los Angeles, I would be bored out of my mind and probably wounded in a drive by. Wildair opens at 6pm and we arrived at 5:30 so we perused the lower east side ‘hood and returned at 5:50. A line had already formed as Wildair does not accept reservations. Within five minutes, 12 more people had joined the group. Being third in line we had our pick of where to sit so I chose the space facing the minuscule kitchen…I love to see how restaurants operate. I counted eight people tangoing behind the counter, gracefully and effortlessly maneuvering. Getting the party started, our astute server, Ethan, recommended a 2013 Espartal, a fantastic Spanish grenache from the Laureano Serres Montagut Winery (($45). 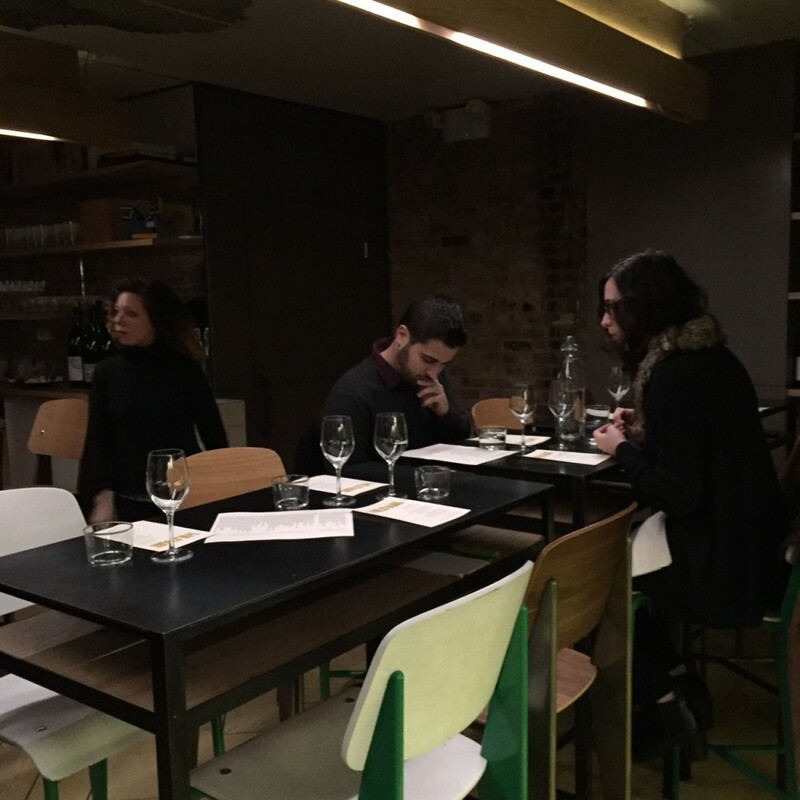 We were later informed by the knowledgeable and engaging Wine Director at both Wildair and Contra, Jorge Riera, that the delectable wine came from a small winery in Tarragona. It was fruit forward with a beautiful cherry bouquet. When at Contra and Wildair, the bread course must be ordered. 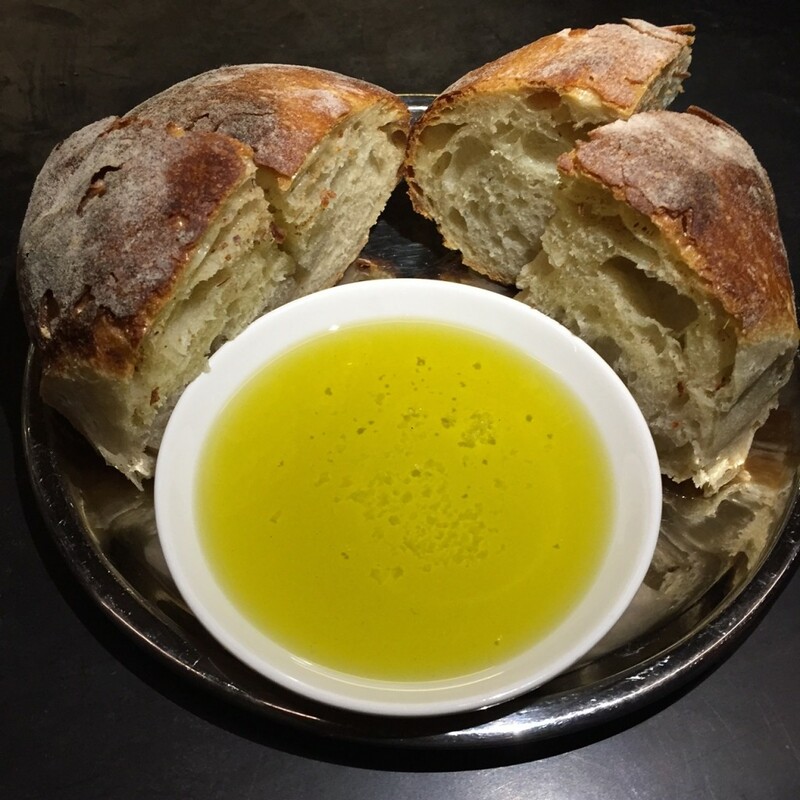 Their bread is seriously the best…crispy, crusty, warm accompanied by rich, salted extra virgin olive oil ($4). I don’t care who you are, screw the carbs…eat the bread at Wildair. You will live to regret it if you don’t. 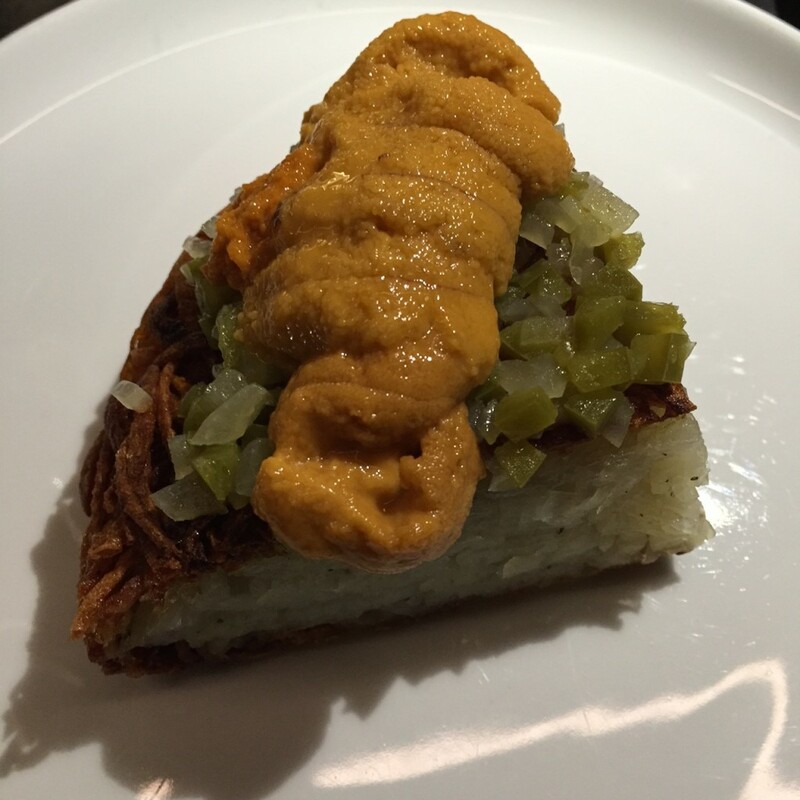 The bread arrived along with a crispy Potato Dauphin ladened with fresh, sweet uni from Maine ($14). I always though Santa Barbara uni was the only avenue to take, but along with lobster and blueberries, Maine is bringing it home with the locally harvested uni. Next, we were introduced to a fabulous sweet potato dish with ricotta, greens, tahini and herbs ($12). This was followed by the most unique and scrumptious Little Gem lettuces salad. 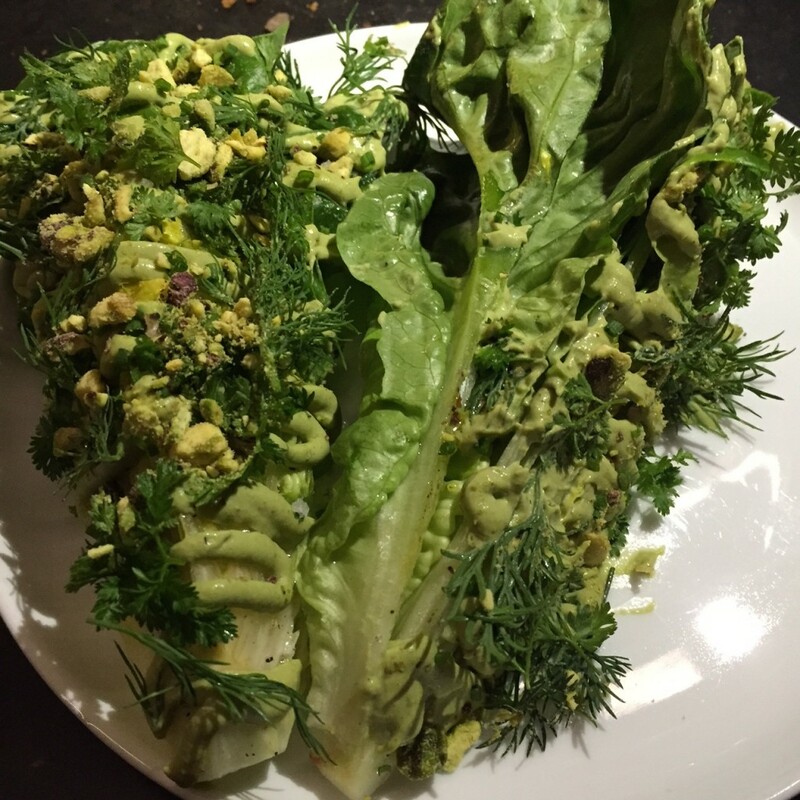 The dressing was interwoven inside the folds of the lettuce leaves and adorned with pistachios ($8). 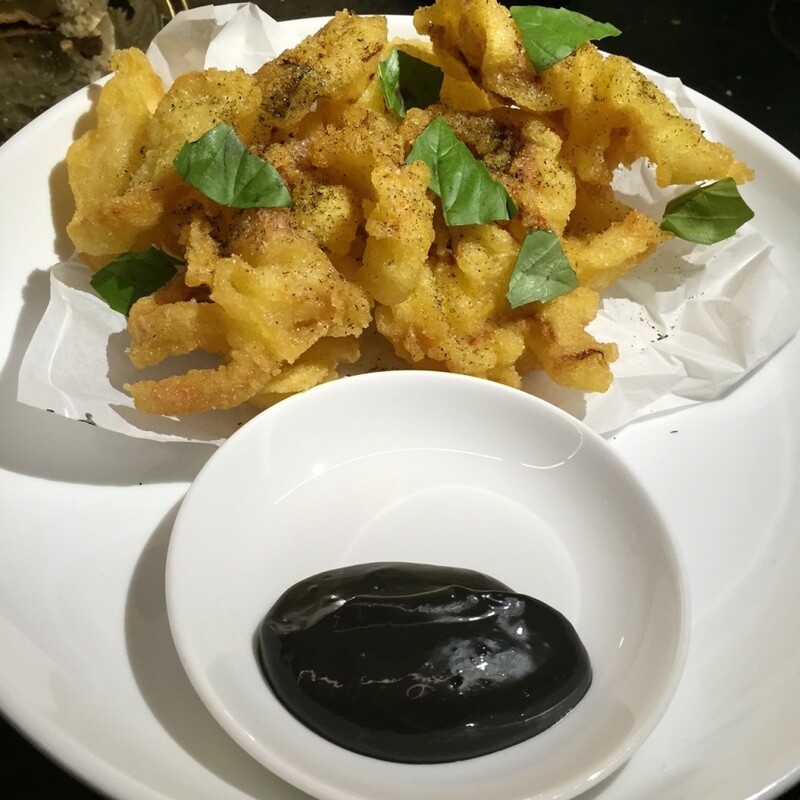 We sampled the fried squid which was prepared to perfection…crispy with thick slabs of squid and an amazing dipping sauce ($15). 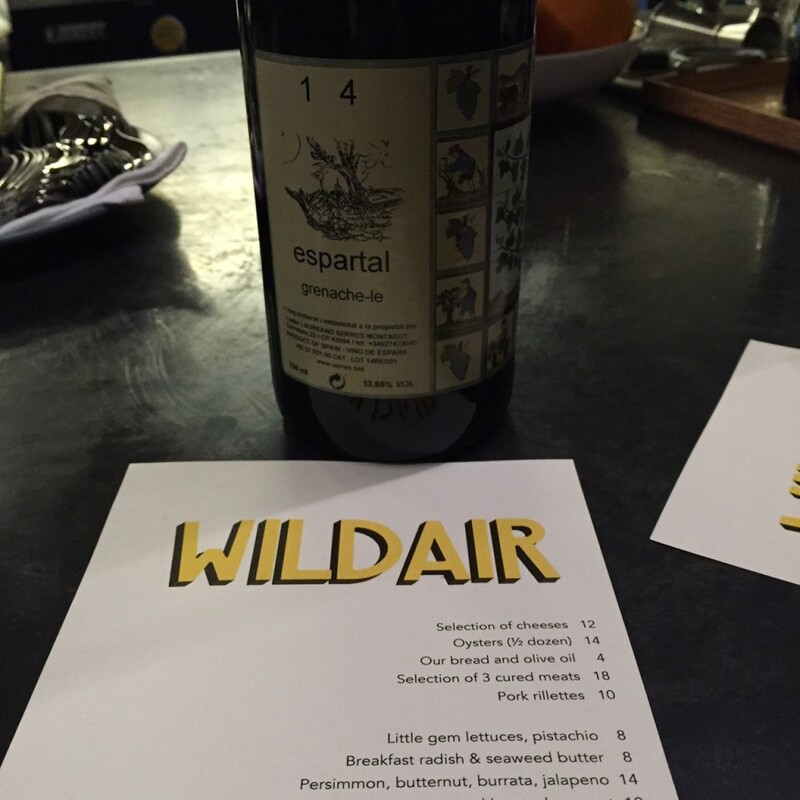 Wildair’s name is as interesting as the food and wine. Contra and Wildair chefs, Jeremiah Stone and Fabian von Hauske, named their wine bar for a prizewinning racehorse that lived in the neighborhood before the Civil War. Needless to say, the neighborhood has invested in another winner. Satiated after indulging for two satisfying hours, I unwillingly departed, but vowed to return to sample some of the other items, including the fresh oysters (1/2 dozen $14), cured meats ($18), pork rillettes ($10), tallow roasted beets and kumquats ($12), bass crudo ($16), beef tartare ($14) and Waygu beef for two ($85). 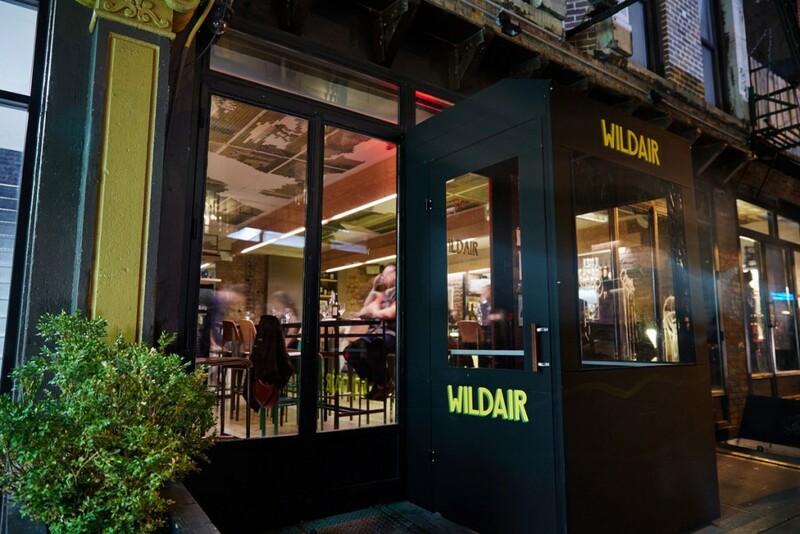 Wildair is proudly perched amongst the top five of my favorite NYC restaurant list. I love that there is no pretension or brainless hosts who flip their hair while advertising ample cleavage and lead you to your less than desirable table on unsteady, too high heels. The servers do not tell you their name unless asked…no one is pushing you out the door even though at 6:15 there was an hour wait. 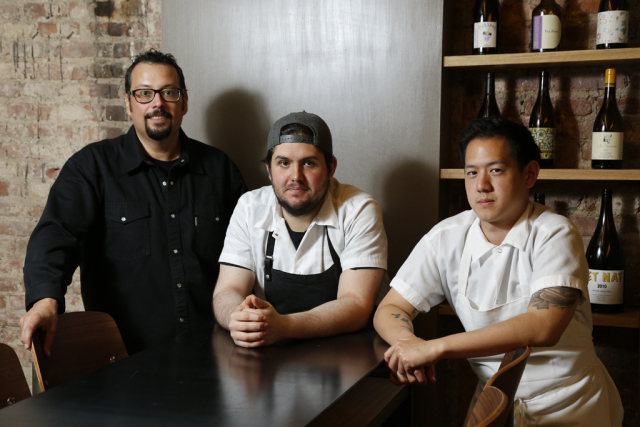 From chef to dishwasher, it is a committed, dedicated team. 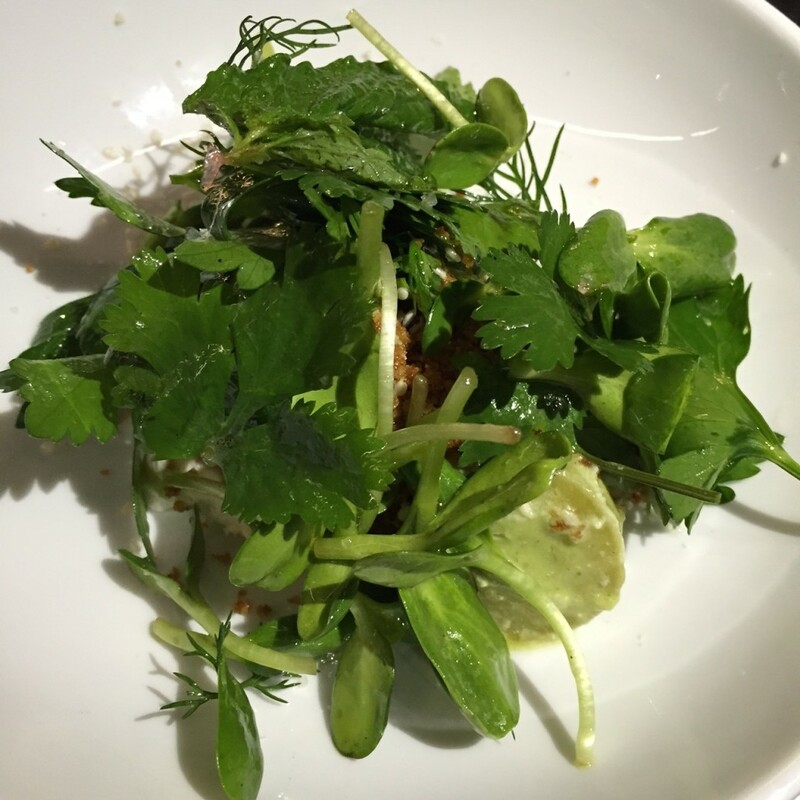 Wildair has succeeded in combining simple, natural ingredients to make each dish uniquely delectable, rendering a memorable and unfettered experience. Wildair 142 Orchard Street New York City. Open Tuesday-Saturday 6-11:30pm. No reservations.